The Logitech M570 is one of very few thumb-operated trackballs on the market. For anyone, like me, who suffers from RSI in the wrist, it is an ideal replacement for a mouse as it removes all the moving back and forth – your wrist stays in one position and does not move when using it. I have had several of these over the years and they have all suffered from the same problem: after just a few weeks of using them, they start to develop problems like double-clicking and dropping files when you are trying to drag. I posted a blog about this earlier. You can read it here. In this post we will teardown the M570 and repair the cause of the problem. 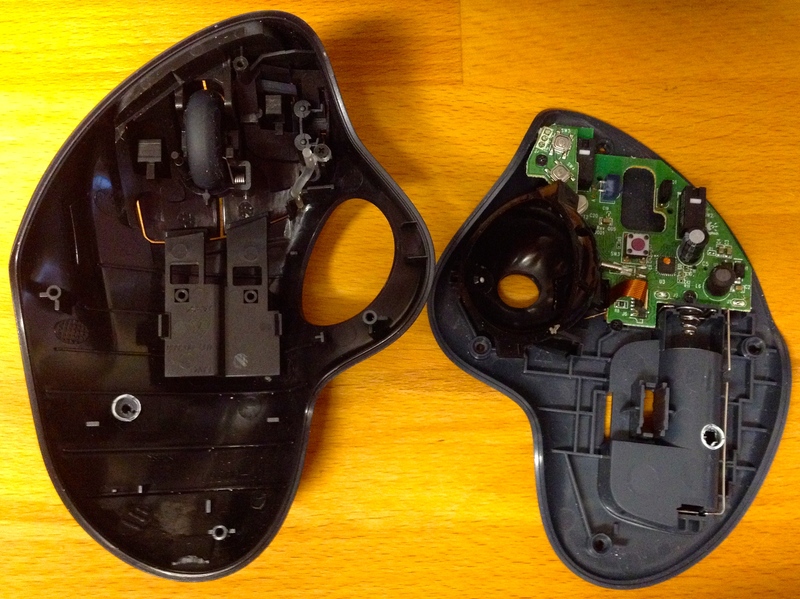 To open the trackball first remove all the major external removable parts: The ball; battery cover and micro-receiver if it is still hiding inside the battery compartment. Next remove three of the small rubber pads – they cover some of the case screws. They can be easily lifted out and if you are careful you can put them back again later without any damage. You don’t need to remove the pad nearest the ball hole, there is no screw hiding under there. Now remove the 5 case screws, one from under each of the pads you removed, and one near the ball hole. There is one more screw to find, and it hides under the battery compartment label. Gently feel for the screw hole under the lable using the tip of the screwdriver, you’ll find it right below the ‘5’ where it says “1.5V AA”. I guess this is Logitech’s attempt at detecting tampering with the device since you have to damage or remove the label to get to the 5th case screw. With all the screws removed the two case halves just pull apart, there are no catches or lugs. Looking at the case you can see a lot of design and engineering has gone into producing this device. It’s a shame it is let down by the small problem that it becomes unusable after just a few weeks! (Your mileage my vary, I use mine all day every day). With the case separated we can see that this trackball uses a single board, and an optical image sensor for tracking the ball movements. It uses two sub-minature microswitches for the left and right buttons and two board mounted captive tactile switches for the auxiliary buttons. By removing 4 more screws you can remove the entire circuit board complete. Look out for the one just below the two auxiliary switches it is easy to miss. The circuit board lifts out when you gently pull the battery contacts out from the guides. Once you lift out the PCB be careful not to lose the tiny plastic switch cover that forms the ON/OFF switch. It will be lying in it’s position in the lower case just waiting to drop out onto the floor, never to be seen again. That’s all there is to it, a nice design, easy to disassemble and easy to reassemble. In the time honoured fashion: Reassembly is the reverse of the disassembly procedure. When re-assembling be careful to align the on-off switch with the tiny slide switch on the bottom of the PCB, so that it is in the correct position for operating the switch once it’s all put back together. Click the thumbnail above to see all the components laid out. There are many reports of this problem with these trackballs, the reviews on sites such as Amazon almost always mention it. The operating pressure required to operate the switch was slightly lower with the factory fitted switches. The factory switches went open circuit almost as soon as you started to release any pressure, whereas the C&K Switches didn’t go open till you had released almost all the pressure. This second point turned out to be the cause of the failures: The switches were making contact when pressed, but releasing with almost unnoticeable reduction in pressure – so when you were trying to click, the natural movement of your finger was causing multiple clicks, and the same when dragging – the natural variation in pressure from your finger was enough to let the switch contacts open and close repeatedly, thus ruining your drag operation. I purchased a bunch of replacement switches from DigiKey – they are DigiKey part number: 401-1742-ND, and C&K Manufacturer part number: ZMCJF7P0T. I have had several of these trackballs over the years. The earliest ones used some cheap looking unbranded switches, but the latest ones used genuine OMRON switches, but they all suffered the same fault. I think the real problem here is that Logitech just specified a switch with with too low an operating pressure, probably in order to make the buttons feel easier to use. With the device disassembled, remove all the solder from the three pins on each of the microswitches. I simply used a soldering iron at 385℃ and some 2.5mm solder wick. If you can’t get the pins cleared then you could try using some ChipQuik. 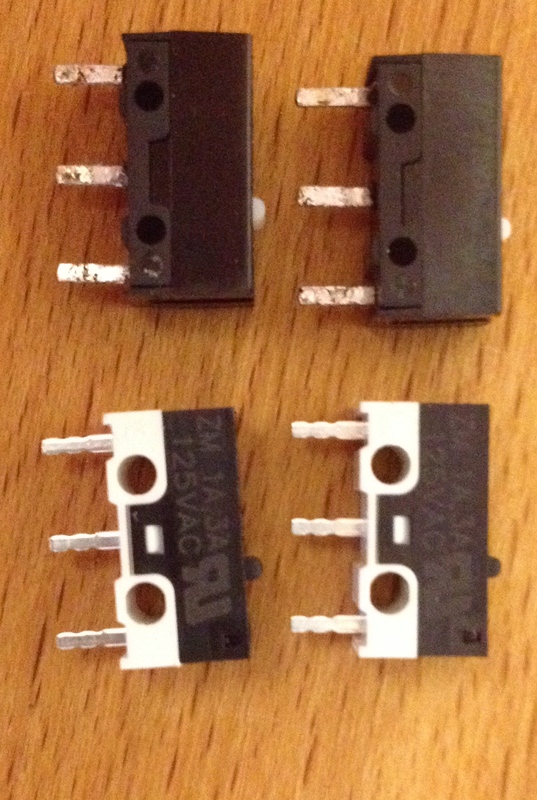 This picture shows a comparison of the factory Omron switches (top two) with the C&K Switches I purchased. (lower two, with white bases). Click the image for a larger view. They are pretty much identical in terms of physical dimensions, but the C&K ones have a much more positive click and feel to them. The actuator might be just a smidgeon higher, but’s hard to see. Solder the two new switches in place, and clean up any solder flux residue with some IPA and the jobs done. Here’s a picture of the board with the two new switches soldered in place. Re-assemble the trackball using the reverse of the procedure for tearing it down and Bob’s your auntie’s husband significant other. 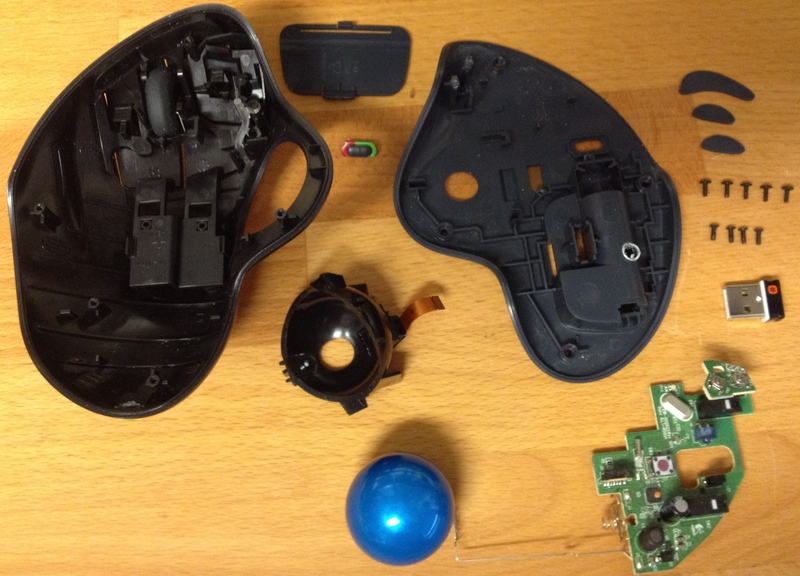 So that’s it for the repair of the Logitech M570 Trackball. Having put it all back together and put the batteries back in I’m delighted with the results, no more double-clicking when it shouldn’t and I can drag and drop without hitch, and the switches have a nice positive feel to them, they are not too heavy to operate at all and have lovely haptic feedback. I would say they feel, sound and work better than they did when brand new out the box. 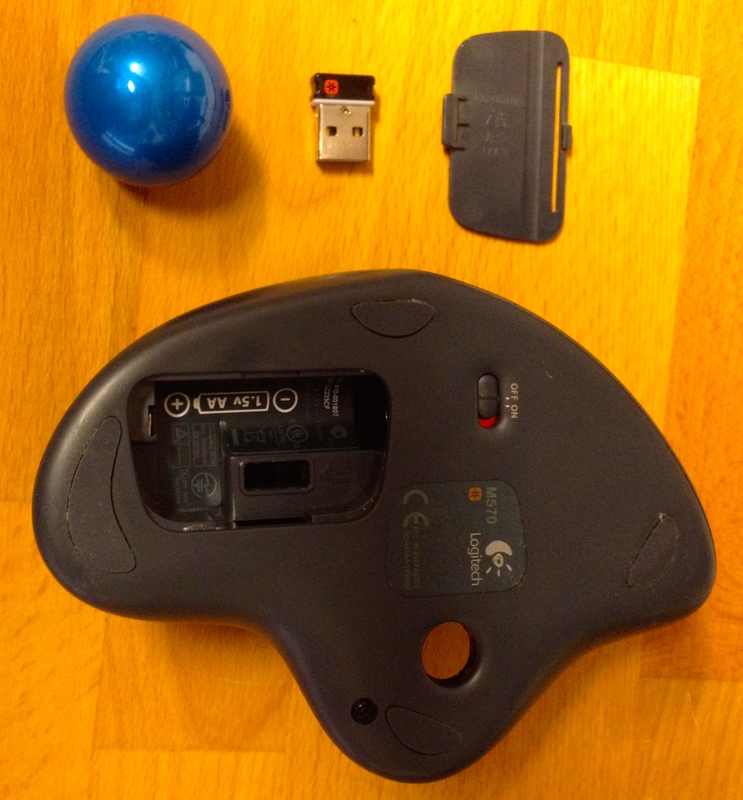 All in all the total cost of repairing the trackball was less then 3.50 GBP ($5.00). I bought 10 of these switches from DigiKey, and have used 4 repairing my two M570’s. So I have six left over if anyone needs a repair doing…. Thank you for concise information on disassembly!! My M570 frequently quits after a few minutes of active use – I need to cycle ON/OFF switch, and/or fiddle with battery (like spin it; battery charge always OK); I guessed the wire spirals (contacts) were pressure-contacted to PCB; thx to your help, inspection finds them well soldered. Any helpful ideas? Any chatter out there re M570 quitting? Thx for looking over this request ….. I have two of these M570 in daily use and have never had them just quit working like that. I’d suggest good alkaline batteries and make sure you have the most up to date drivers installed on the PC. I have the same type of problem. The left button clicks on its own. Ordered parts as per your instructions. Will see. Recently had the same problem with my M570. Swapped the switches from an old Dell mouse and everything works great! Thanks for the tutorial! Thanks for this, really helpful. My 570 left mouse button had become sticky. This tear down made it really easy for me to tear mine down and identify that it wasn’t the micro switch but something had jammed in the actually plastic button which was easy to spot and remove. Nice to know this helped. Have you had any issues with the “forward” & “back” buttons mounted to the left of the left-click button? I find that the “forward” button (the one located toward the front of the device) does not have a tactile *click*. Rather it is a quite a soft click with very little feedback. With your instructions I am feeling brave to tear it apart, but thought I’d ask if you have had any experience with the feedback on these other buttons. TBH I could never get used to the forward and back buttons. So I’ve never really used them! I’d suspect it’s a similar issue. Got it sorted. I took it apart and it was an issue with the plastic moulding. There are two little plastic pins that activate the forward back buttons. One had a sort of crown left on it from the manufacturing process that prevented it from retracting the way it is designed to. After scraping off the crown with an blade, the button functions as it is supposed to. Good thing it worked, I just bought it today but loath the idea of using time to go back to the store and have them process it under warranty. Great site, thanks for the response. Thanks for the parts research! I just replaced the left button – just had to shave down the plastic bit that makes contact with it, since the new part sits higher than the original one. Interesting that the new part sits higher. On my two M570’s the new part was almost identical to the old one, with the exception of the operating force. What was your process for finding a replacement part? There doesn’t seem to be a nice way to match the dimensions or footprint using the parametric search. I figured that finding one would be nearly impossible and was planning on attempting the spring straightening repair. I’m going to order the part from Digikey and hopefully have my trackball working again soon. Thanks! You are right about the parametric search. Initially I just looked for a switch which was visibly very similar, and I was lucky to find that it was a perfect match. I installed the new switch last night and it works a treat. The new switch is much stiffer than the original; it’s going to take a bit to get used to. I took video of the repair which I’ll post to youtube eventually. Superb post; it should be a model for others. Thank you. I have 2 M570s that I now plan to repair for the occasion when my 3rd dies. After replacing your M570 switches with the C&K Manufacturer ZMCJF7P0T switches, have they lasted longer than the original? Yes – Several years later and both of my M570’s are still working great!